In the just concluded Ugandan elections– there were so much online activity especially with Twitter. Hashtags were using by the top 3 presidential candidates daily to put across their message to the online publics. Just before December 2015, I remember that over 1500 tweets were sent out with the hashtag #UgandaDecides every two days. This momentum was sustained up until Election Day. Even with the Social media blackout a significant amount of tweets were sent out via VPNs. The highest number of tweets though was sent out during the presidential debate. #UGDebate16 was trending globally with 129,000 tweets sent out on 14th February about 2:00am local time. That was history made for the online community in Uganda. All of a sudden there was so many people talking Ugandan Politics in a central place and Twitter was that place. Who thought that Political Conversation would be at the forefront of all engagement on Social Media in Africa? This morning – Portland Communications launched the 2015 Report on how Africa Tweets. Twitter has become ‘that thing’ on the African Continent – especially while being used for Political Debate. Analysis by Portland found that almost 1 in 10 of the most popular African hashtags in 2015 related to political issues and politicians, compared to 2 per cent of hashtags in the US and UK. The top political hashtag in Africa was focused on the highest profile election on the continent last year – #NigeriaDecides. Some of these hashtags I don’t even remember. But yes, Data does not lie. The Report is available here. All African Countries are represented apart from South Sudan and Democratic Republic of Congo – where it was hard to collect any information. Although tweets about showbiz and entertainment dominated the conversation last year, representing over 20 per cent of all hashtags, discussion around politics has grown to 10 per cent. Nigeria, South Africa, Ethiopia, Burundi and Egypt were the most active in these political conversations. The report also found that interest in politics transcends national borders. For example, hashtags about the Nigerian Presidential Elections and strife in Burundi were among some of the most popular and widespread hashtags across Africa. English is by far the most dominant language on Twitter in Africa. This lingua franca has helped bridge national and cultural barriers across the continent, providing Twitter conversations with a wider reach than those using conventional media. 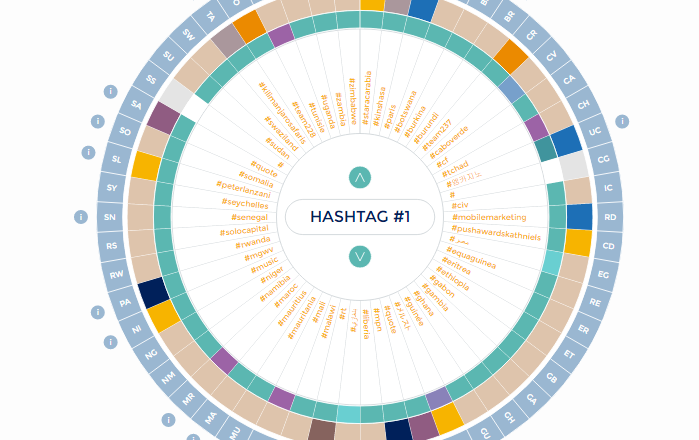 Of the top 5,000 hashtags that we analysed, 77% were tweeted in English. Other top languages like Arabic and French were tweeted significantly less – only 7% and 4% respectively. Twitter in Africa is used distinctly less for commercial campaigns than in other parts of the world. Commercial hashtags (such as brand names and promotional offers) are 25 times less prominent in Africa than in the USA, for example. Egypt tweets the most out of any country in Africa, with 28% of all geolocated Twitter volume (amounting to about 450 million tweets). Nigeria (350 million geolocated tweets), South Africa (325 million geolocated tweets), Kenya (76 million geolocated tweets) and Ghana (65 million geolocated tweets) round out the top five tweeting African countries. Overall, there were 1.6 billion geolocated tweets in Africa in 2015 – a 34-fold increase from our initial research in 2012.